Today is the last day of my 30 in 30 self-assigned project, and I thought it would be appropriate to cap it off with the short film me and my buddies James S. and Greg K. shot as our entry for the 48 Hour Film Festival — a national short film festival that assigns its participants a random genre, prop and line of dialogue out of a hat, then requires them to conceptualize, write, shoot, produce, and edit a 5-7 minute short film in 48 hours. It’s a really cool concept, and I’m pleased with what we produced, given the constraints of the festival. Of all the things I have done on zero sleep, this is probably one of the ones I’m most proud of, and least worried about getting arrested for. I hope seeing this film completely changes your life. I’ve included the embedded version at the bottom of the post, but since we shot this in HD, it will probably look better if you watch it on youtube’s actual site. Click me to see the best movie of ever right on your computron machine. At some point over the weekend I’ll probably post some sort of recap on my thoughts on this forced creativity of the 30 in 30 project I’ve been doing, but as a general wrap I’d just like to say that I appreciate the kind words and encouragement from the people who’ve liked what I’ve been doing, and the tolerance from people who’ve hated it. Even though it probably won’t be daily, I’m excited that I’m back in the swing of forcing myself to create even when it’s not convenient, and I’ll continue to post things for you internet people to digest when there’s nothing better around. All the best, and thanks for sticking with me. So let me just say that I spent a few minutes tinkering on my ukulele (purchased yesterday as you may recall), and figured out the theme song tag from my all time favorite television show, Arrested Development. Playing the AD theme on my own ukulele: check another one off the bucket list. I hope this inspires you to quote the best show ever cancelled nonstop for the next two weeks. Don’t leave your Uncle T-Bag hanging! THINGS I BOUGHT TODAY! (and why). 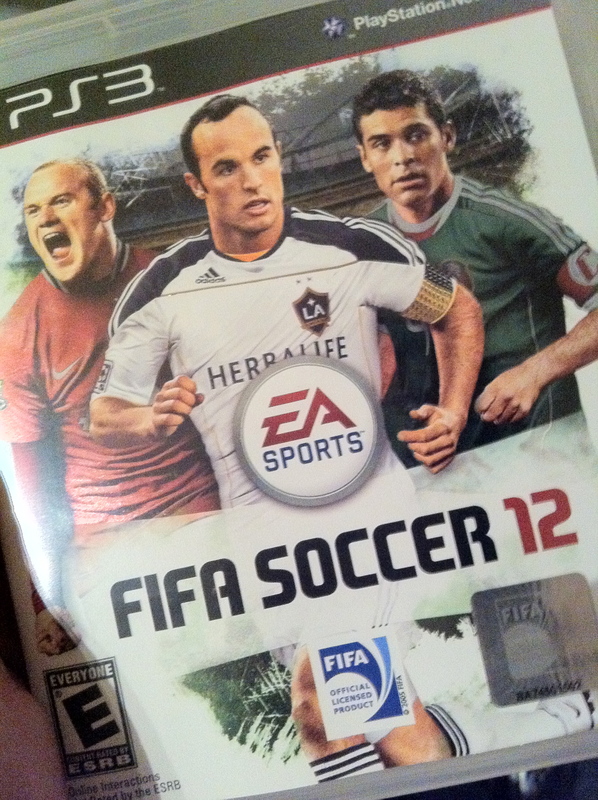 An increasingly-rabid fan of the FIFA Soccer videogames (and soccer in general) since the early 2000’s, I can hands-down say this one is the best of the series to date. All the usual graphical improvements, but with a host of additional refinements that will really please people who love sports as much as they love pretending to play sports. Whether the occasion is a birthday, holiday, anniversary, or Jewish high holy day, a constant frustration I hear from many girlfriends/wives is that they’re almost never sure what would be the best gift to get their man. Well fret not, considerate ladies of the world, because I’m here to tell you the five gifts that any man you’re dating will want (so I hope you saved the receipt for that 70th Anniversary Collector’s Edition of Gone with the Wind). In contrast to the last song I toyed with, this time I wanted to lay down something acoustic and pretty bare from a recording standpoint (I did everything in pretty much one take, minus the bridge vocals because they overlap slightly), so I picked a song that I’ve always sort of vibed with when I’m in my slightly more emo moods. Like most of the things I’ve been doing in this 30 in 30 project, it’s less about showing off what a stellar musician/vocalist I am (clearly not the case), and more about continuing to spur myself on creatively and stretch my comfortability with different mediums. As always, share anything you like with your friends, and please feel free to criticize all my musical flaws and shortcomings in the comments section.